Being at any place in time where Mother Nature decides to show us what's really up her sleeve is a feeling very hard to express. I'm afraid I ran out of words for this one, so I will let my photos do that for me. Thanks so much for your photos. My son's friend works at the Volcan Fuego Observatory through Michigan Tech University and the Peace Corps and I was a bit concerned. I'm sure he had a front row seat and was loving every moment of it. Hi Becky -- thanks for the comment. I'd love to hear of your son's friend experience of this .... please feel free to e-mail me at at the address at the bottom of this site anytime. WOW - How long did the show last? Thanks Loz --- the volcano was erupting most of the day and was eventually obscured by cloud cover about 10 PM -- so several hours altogether. Amazing! Have seen such stuff on National Geographic and Discovery channels. Can't imagine how it would be to see it live though. 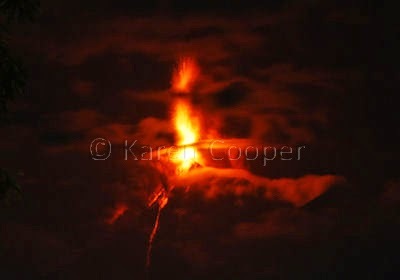 Amazing and great pictures of the erupting Fuego volcano ! You was lucky to look and hear that eruption scene. Alain (geologist) from Belgium.